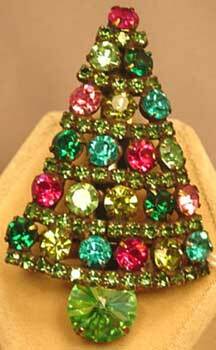 Description: Bauer Small Criss Cross Tree - This diminuitive tree at 1 3/4" x 1" is in a special combination of deep red and green and clear rhinestones. Antiqued brass setting, this is unsigned, just too small to find a good place for the Bauer logo. Domed, three dimensional piece, and much nicer in person than my photograph conveys. 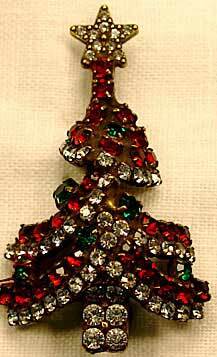 Description: Bauer Olivine Christmas Tree Pin A new tree for 2000, this is done in antique brass, which has almost the same effect as gunmetal or japanning to make the stones "pop" out at you. 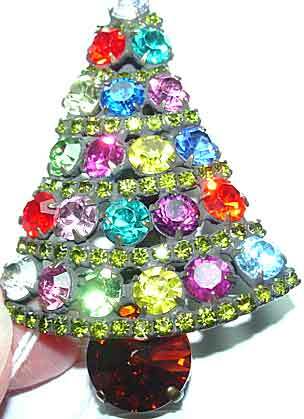 Olivine rhinestones make up the tree; each bough culminates in a fuchsia rhinestone baguette candle with a round clear rhinestone flame. Almost 1.75" in both directions. All stones are prong set. Limited Edition. 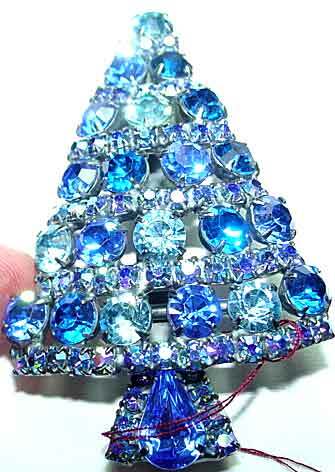 Description: Bauer Have A Ball Blue Tree Pin - This has been such a successfully tree for Dorothy that she has decided to do more limited editions of this design in other color combinations. This one uses an intense combination of sapphire, capri (peacock) blue and aqua rounds separated by garland in sapphire aurora borealis. 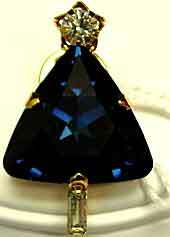 A single sapphire blue pear rhinestone is outlined with this same chain for the base. Antiqued silvertone setting. 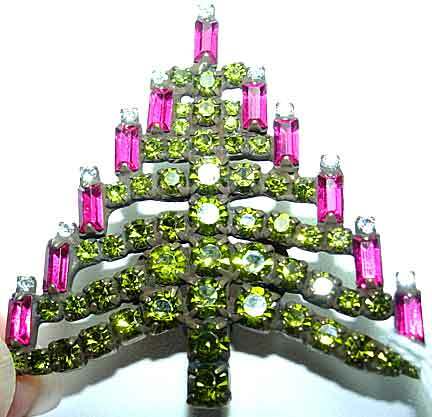 Description: Bauer Have A Ball Peridot Tourmaline Tree Pin - The same design in a wonderful combination of green tourmaline line rhinestones and "balls" in olive, teal, fuchsia, pink, and lime (peridot) green, with a large peridot rivoli rhinestones for the base. Set in antiqued brass, limited edition. 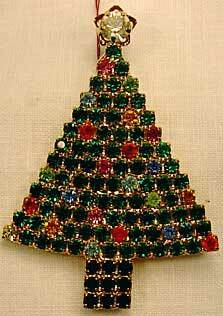 Description: Dorothy Bauer Tac Tree -Dorothy's classic tac tree! Available in Montana (dark navy blue).